The ‘Green Belt’ in north-east India is rich in biodiversity and forest cover. The climate is subtropical with hot, humid summers, severe monsoons and mild winters. High soil fertility and preferential climatic conditions have formed a dominant agrarian economy, with a wide variety of agricultural crops cultivated. Of these crops, tea is of major economic importance in this region. India is the world’s largest and longest established producer of black Tea. 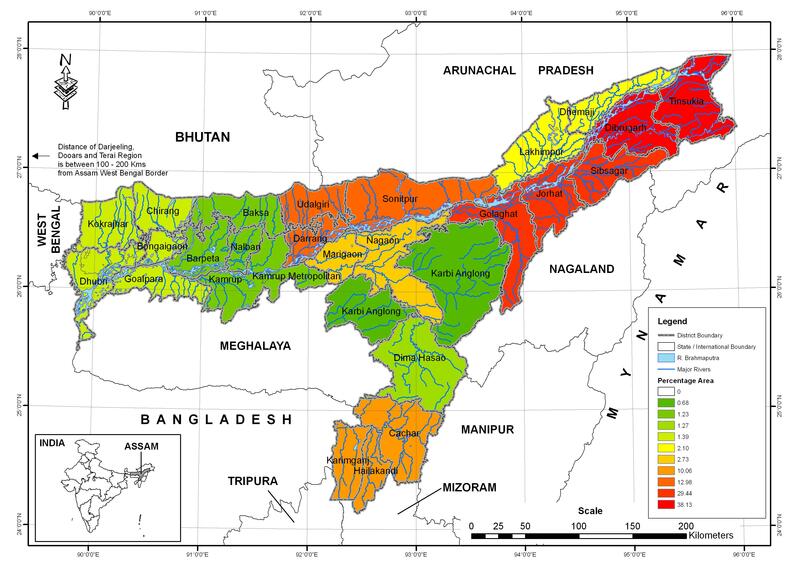 Tea is grown across the north-east region in parts of Assam, Terai, Dooars and Darjeeling (see image above). The state of Assam is one of most globally important tea-producing regions of world manufacturing high-end graded tea which contributes to around 17% of world tea production and annually produce more than 50% of India’s total tea. Around 2 million labourers in Assam are dependent upon high tea yields, both in quality and quantity. Approximately 75% of tea crops are cultivated in plantations and 25% through smallholder plots.